Today, Nissan wrote to HEXUS about some new automobile technology that goes beyond autonomous driving to make the car more responsive to the human hosts, and make driving more enjoyable. 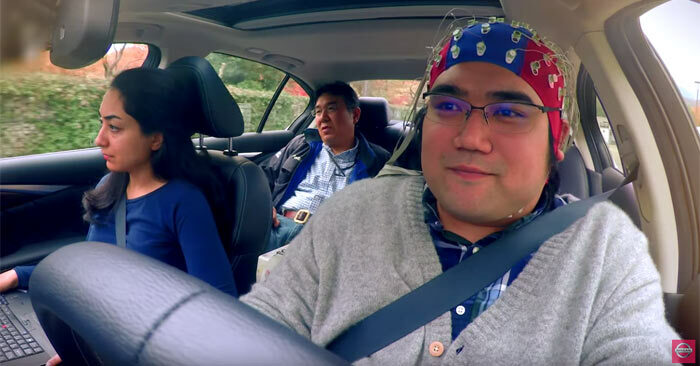 The new technology has been dubbed Brain-to-Vehicle, or B2V, technology and is said to enable vehicles to interpret signals from the driver's brain, "redefining how people interact with their cars". It's interesting to hear of Nissan's new B2V technology research as most other vehicle companies stride forward to remove the human from the driving equation. "When most people think about autonomous driving, they have a very impersonal vision of the future, where humans relinquish control to the machines. Yet B2V technology does the opposite, by using signals from their own brain to make the drive even more exciting and enjoyable," said Nissan Executive Vice President Daniele Schillaci. "Through Nissan Intelligent Mobility, we are moving people to a better world by delivering more autonomy, more electrification and more connectivity." 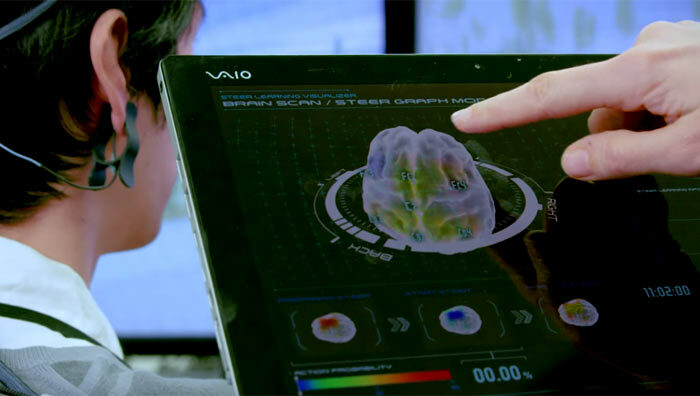 The B2V tech is used for two main tasks from its real-time decoding of motor cortex activity. First of all B2V can predict a driver's next action and leverage driver assist technology to begin any action more quickly. Secondly B2V can change driving style depending upon the human controller's discomfort or fatigue levels - moving to a greater level of autonomous behaviour when needed. For B2V to work the driver has to wear a device that can measure brain wave activity. In the video you see various subjects wearing different kinds of sensor caps, some more modern and less experimental looking than others. Nissan claims that the B2V system can anticipate driver intentions such as steering or slowing down quicker than the driver could react (by approx 0.2 to 0.5s) while remaining imperceptible to the driver. At the CES 2018 next week Nissan will have a booth allowing users to test drive its B2V tech in a driving simulator. Getting EEG to work in a typical car is not a simple task, normally research is done in a Faraday cage to eliminate any induced voltages. I wonder how they're making the car “brake better” or “corner better” with the forewarning? My friend whose a neuroscientist was telling me about all of the electrode technologies they use and in most cases the signals being read for this kind of thing are strong enough thatbwith shielded electrodes and cabling you dont need outside shielding from outsource emf. However if you go for deep brainwave analysis like for image recognition or thought type recordings then absolutely having an emf free environment is a must. Oh jeez, will manufacturers PLEASE stop with these stupid ideas for future cars… they're solutions to problems that don't even exist!! Then it doesn't matter what they think, because by definition this is NOT autonomous, is it???!!! You mean the car will stream adverts from whoever inevitably sponsors this junk, and plaster it inside all the windows to the literally captive audience within? Yay, progress….. The more connected, the more hackable and/or susceptible to system bugs. Good plan. Oh, I'm sure it will indeed have THE absolute latest in technology, software and security… How's that working out for Intel and Micosoft? You want to take a powerful weapon like a car and connect it directly to the most irrational, stuffed up brains on the planet? Go home Nissan, you're drunk!! I wonder how they're making the car “brake better” or “corner better” with the forewarning? Don't see how they can. If your foot is on the accelerator, then the car shouldn't be breaking. Second law of robotics. My car senses when you take your foot very quickly off the accelerator, and starts filling the brake calipers on the expectation you will hit that pedal next. No brain wiring required. But …. you've answered your own question. You said it yourself …. your car senses you taking the foot off the accelerator, and predicts what comes next. But for that to be happening, your foot has to be moving. Now, if this B2V idea works, they're looking at …. call it ‘latency’ in the process of luzard brain reacts to stimulus, conscious mind thinks “need to brake”, nerve signals get sent, muscles contract, bones move, foot lifts and only then does your cars predictive tech start anticipatoty loading of brake cylinders. But if we're talking about sensing, direct from the brain, that your noggin is about to brake, then it can bypass all the really slow mechanical bits like muscles, etc. If you like it's like SSD rather than HD …. you get the speed improvement largely from keeping it electical and eliminating the really slow mechanical bits of spinning platters and relocating read heads. Whether the public will, literally, buy into the concept or not is anothdr matter. Then again, it's not as big a leap in public acceptance as fully autonomous cars … which, despite my personal reservations, I do belueve is coming, and relativsly soon. Just as soon as the tech is proven and they sort out the far trickier issues like liability for crashes, insurance, etc.